Who would have thought it? As we head into the final week of the season, Riyad Mahrez tops the Fantasy Football points scorers, with Leicester team-mate Jamie Vardy right behind. It’s just been that kind of season. A quick look at the best players to pick shows zero Chelsea, Liverpool or Manchester United players in the mix, and just Alexis Sanchez and Mesut Ozil stepping up for Arsenal and Manchester City. In place of the regular names, aside from the aforementioned Leicester pair, come Dimitri Payet from West Ham, Odion Ighalo at Watford, and no fewer than four Tottenham players in the top 11 scorers. In short, it’s been a nightmare season to call! But the Ladbrokes Life gang have battled on, and now plan their final teams as they bid goodbye to the Ladbrokes Life League. Mr Brightside leads the bragging rights, but can he hold on? It all comes down to this! We’re still in pole position, so we just need one more solid performance and we’ve done it! There’s no point looking over our shoulders but just to look at the job in-front of us. 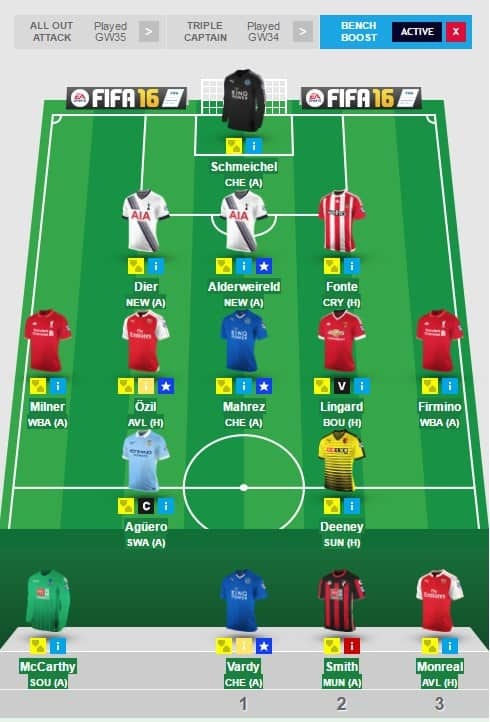 Here’s the team that will take us to victory. Premier league champion Kasper Schmeichel in-between the sticks. He’s been a brilliant replacement for Butland with the joint-highest amount of clean sheets this term. I could’ve used my all-out attack but I fancy the trio at the back to all pick up points on the final day. Productive full-backs Cresswell and Bellerin have been class all year and I’m hoping Manchester United’s player of the season Chris Smalling will finish on a high. In comes Arnautovic to the midfield, and with a record 11 goals for Stoke in a Premier League I fancy him to finish the season at The Britannia with a bang. Willian, Mark Noble and Ross Barkley make up the rest of midfield, with little to play for, I’m expecting goals and assists. Martial’s brace at The Boleyn keeps him in the team for the final game and he’ll be up-front with Sergio Aguero and Harry Kane, who are both battling for the Golden boot. Kane gets the arm band! Should Roberto Firmino play and produce the goods again I’ve used my bench boost to maximize the squad. Great points from my West Ham and Man United players this week but again a case of too little, way too late. 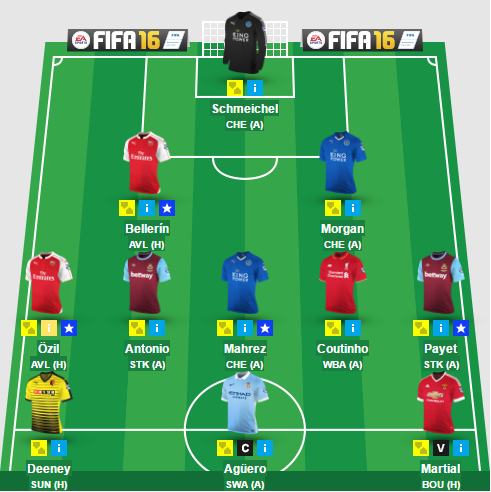 I’ve gone for a very similar line up this week with an in-form Mata making it into my midfield ahead of Mahrez. Martial’s double at The Boleyn makes him the first United player to hit double figures and gives me faith in giving him the armband again, hopefully he’ll knock in a few against a shaky Bournemouth defence. 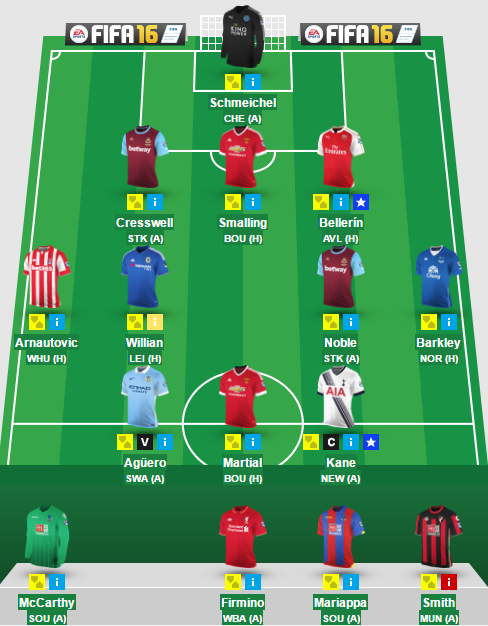 Bench Boost is activated for the final gameweek because… why not? Last week wasn’t a bad return with a whopping 75 points coming my way. Sunderland’s Patrick van Aanholt was the biggest earner with 17 points. I now find myself 23 points behind Mr Brightside with one game left, there’s no margin for error. I need the team to stand up and be counted. The gamble to captain Daniel Sturridge in the double game week didn’t go to plan as he failed to make an appearance in the first game and didn’t do much in the second. 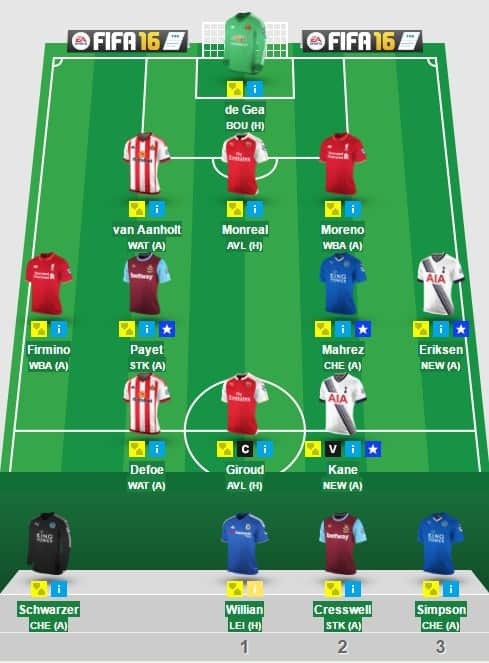 I’ve made one transfer this week and its Daniel Sturridge out and Olivier Giroud in. I know Giroud has been terrible for most of the season but with Arsenal at home to relegated Villa and the Frenchman getting on the score sheet at Man City I’m hoping, no, praying he can bag a few on the final day wearing the captain’s armband. 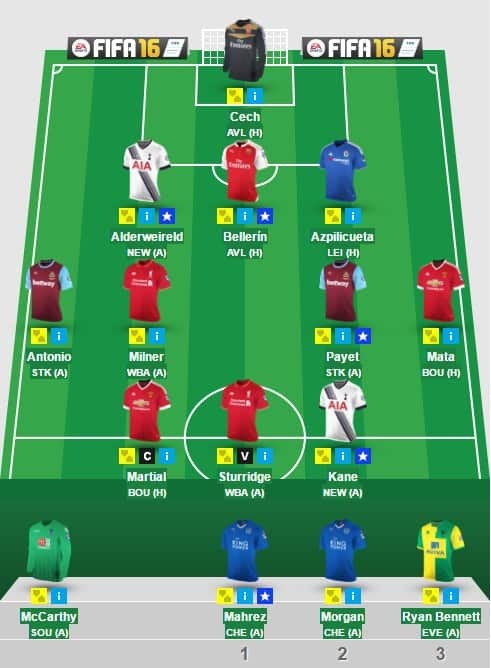 It’s all or nothing and bench boost has been activated to hopefully bring in the needed points to jump Mr Brightside. Thank God this season is finally over! I’ve been the Aston Villa of the Fantasy Football league and it’s nothing but relegation to the lower divisions. I’ve brought in Vardy for the final week with the Leicester frontman eyeing up the Golden Boot, he should good for a few points. I’ve also chucked in a Bench Boost seeing as it is the final week. Another good week for the Gut Truster and I’m still hopeful of catching second place going in to the final fixtures of the season. Ross Barkley, like Everton has done pretty much nothing for my team in the last month or so, he’s replaced by goold old Riyad Mahrez. Leicester will be looking to end their already unbelievable season on a high, as the new champions take on the former champions! With one booster still available, All Out Attack is active, and with my five midfield maestro’s I should rake in the points! I’ve swapped the captaincy back to Sergio Aguero as Man City will still be sweating over finishing in fourth place, and will look to the little Argentine to salvage it for them.